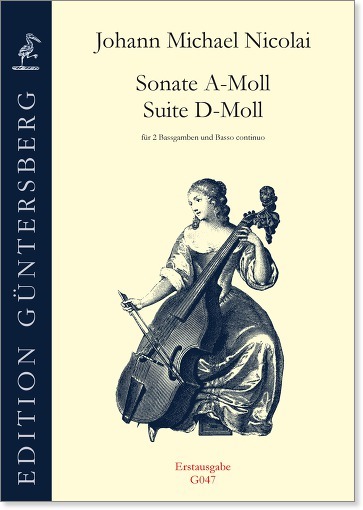 Sonata in A minor and Suite in D minor for 2 bass viols and b.c. Editor: Günter and Leonore von Zadow, publication date: 2004-02, continuo realisation: Gunter Morche, source: RISM: GB-DRc D10 etc. These non-autographed pieces are found in the same source manuscript as the Sonatas by Nicolai for three bass viols (see G041). As they are very similar in style and harmonies to the Nicolai works we have attributed them to him. 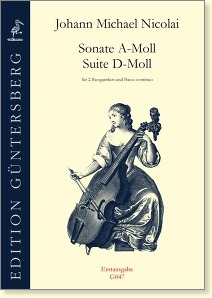 The second viol functions both as solo and bass instrument. Thus, this Sonata can be played also when a keyboard instrument is not available. The part of the basso continuo G047C now contains the figuring as well. To view and print please click here: G047C.